Four US soldiers with the Nato-led force in Afghanistan have been killed in an attack by suspected Afghan police, say US and Afghan officials. Five police were missing after the checkpoint attack in southern Zabul province and one was killed, they said. The incident brought to 51 the number of Nato troops killed in "insider attacks" this year. The latest incident comes a day after two UK soldiers were killed at a checkpoint by a man in police uniform. On Friday, two US marines were killed in a Taliban attack on Nato's Camp Bastion base in southern Afghanistan. Militants breached the perimeter of the sprawling Camp Bastion base in Helmand province, destroying six US Harrier aircraft. The four US soldiers were killed as they tried to stop an insurgent attack on a police checkpoint in Mezan, a remote area of Zabul near the border with Pakistan, said Zabul deputy police chief Ghulam Jelani Farahiof. They were killed by a man in an Afghan national police uniform, he said. An Afghan report that they were members of the special forces has been denied by Nato. Senior Afghan officials said one suspected policeman had died in the attack and five had gone missing since. It was not clear whether the five were involved in the attack or had fled fearing they would be held responsible. A number of international troops were wounded in the attack, reports said. An investigation has been launched. Further details have been released about Saturday's rogue attack on British soldiers in Helmand province. Nato wants to present a message of progress in Afghanistan - that the Afghan security forces are now taking responsibility for their own country. But the events of the last few days have undermined that message - the greatest concern the rising toll of so-called green-on-blue killings. On a visit to Kabul last week the UK defence minister said he was "reassured" by President Hamid Karzai that the Afghans were addressing the problem with more stringent vetting. But with Nato churning out more than 25,000 Afghan army recruits each month and thousands more police no-one can guarantee that such incidents will not recur. The insurgency has been weakened, but this weekend's brazen attack on the heavily defended Camp Bastion shows that it can still mount well-planned and co-ordinated attacks. Though the attack was eventually repelled, the insurgents still managed to destroy half a dozen US warplanes, damage infrastructure and raise more security concerns about the safety of the UK's Prince Harry. Inevitably this week will have raised questions about what progress is being made. It is understood that the Afghan had claimed to be injured when members of the British patrol went to assist him to receive medical treatment, says the BBC's Jonathan Beale in Kabul. As the soldiers came to help him the uniformed man opened fire, killing the two soldiers before he was himself killed in return fire. If confirmed, Sunday's attack takes the number of Nato soldiers killed in insider - or so-called "green-on-blue" - attacks to 51 for this year alone. They risk undermining the programme to train Afghan forces, correspondents say. 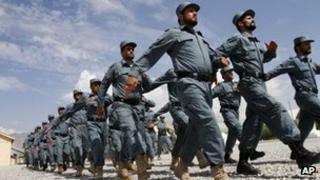 The rash of attacks prompted the US to suspend training for new recruits to the Afghan local police (ALP) earlier this month. Some 700 members of the Afghan security forces have been ejected in the past month as part of increasingly thorough check being put into place by authorities, according to Afghan officials. But ultimately, it is very hard to guarantee against this type of killing, our correspondent says. Meanwhile, more details have emerged about the attack on Camp Bastion, which the Taliban said was in retaliation for a film mocking Islam made in the US. In a statement, Nato said the attack had been carried out by 15 insurgents dressed in US Army uniforms who "appeared to be well-equipped, trained and rehearsed". "The insurgents, organised into three teams, penetrated at one point of the perimeter fence," it said. As well as the six American AV-8B Harrier jets destroyed, two were significantly damaged. Three refuelling stations were also destroyed, and six aircraft hangars were damaged. Fourteen of the insurgents were killed, Nato said, and one was taken into custody. Nine coalition personnel were wounded.